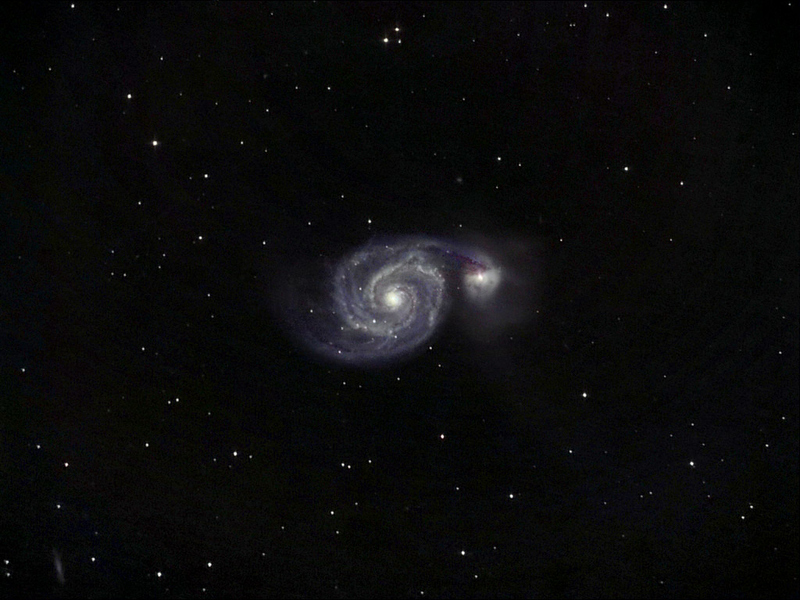 Last night cleared a bit unexpectedly and became reasonably transparent which allowed me to get a set of subs for M 51. I would like to have got a deeper image but I think a better evening and some longer exposures are required for a noticeable improvement at my current level of processing expertise. At least I did manage to get focused this time. The galaxy at lower left is IC 4263. Details: 10" f4.3 Newt. 10x 10 minute exposures @ iso800 with CLS in DSS, CS2, Photobrush & XAT. A very nice image Pete. I also imaged M51 on Monday night to test my old Focal Reducer with the Canon 350D. It certainly helps imaging at F6.3 as opposed to F10 but I just don't seem to be able to get the level of detail you've captured here (and as a stroke of coincidence we both seemed to have taken 10x 10 minute exposures!). I think it all boils down to the difference between a slow 6" scope and a fast 10". Even so, I do think the IM603 is doing quite well for its size. I must admit that the colour shift problem caused by the CLS filter is bugging me to the point where I think I may have to take a look at modifying the camera.